GAHS freshman Seth Nelson races toward the ball during the Blue Devils 9-0 victory over Portsmouth on Thursday in Centenary, Ohio. CENTENARY, Ohio — More than a little lop-sided. 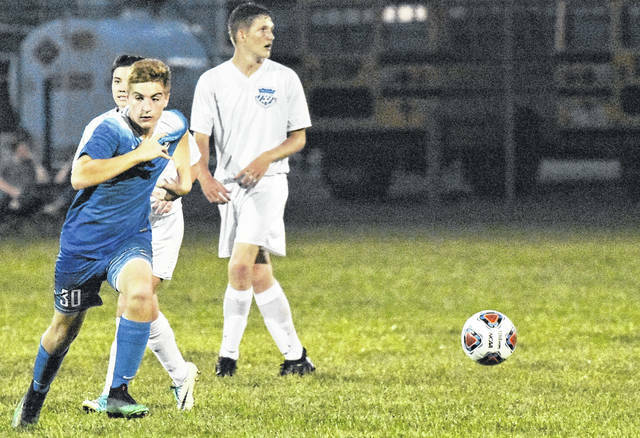 The Gallia Academy boys soccer team earned a 9-0 shutout win on Thursday night as visiting Portsmouth was held to four shots in an Ohio Valley Conference contest at Lester Field. GAHS (4-1, 3-1 OVC) scored four goals in the first half, as Pedro Herrera provided the Blue and White’s initial goal in the eighth minute. Justin Day pushed the lead to 2-0, in the 22nd minute, and Dalton Vanco tacked on Gallia Academy’s third goal in the 26th minute of the contest. Emmanuel Valdez extended the advantage to 4-0 with 9:55 remaining in the half. Following the intermission, Brody Wilt’s scored at the 33:45 mark of the period to push the deficit to 5-0. Valadez added his second goal of the match with 20:32 remaining to widen the margin to 6-0. Tristan Polsley scored with 17:54 left to staked the hosts to a 7-0 lead. 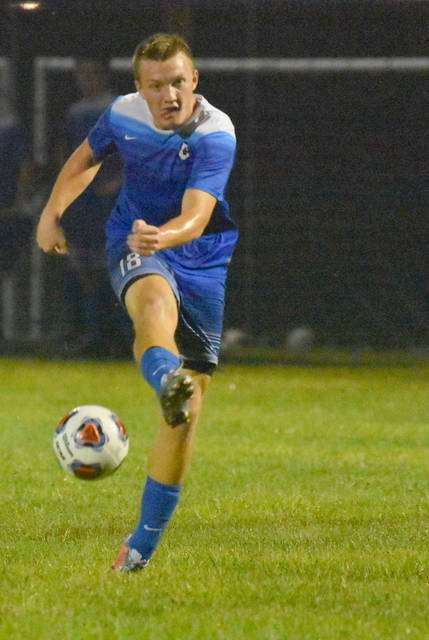 Wilt completed a hat trick providing Gallia Academy’s final two goals when he scored in the 57th and 71st minute of the match to close out the 9-0 win. The Blue Devils outshot the Trojans by a sizable 36-4 margin and also claimed a 14-1 advantage in corner kicks. The victory serves as a season sweep for GAHS, having earned a 10-0 win over the Trojans on Aug. 22. GAHS returns to the pitch on Tuesday to host Fairland in an OVC match.